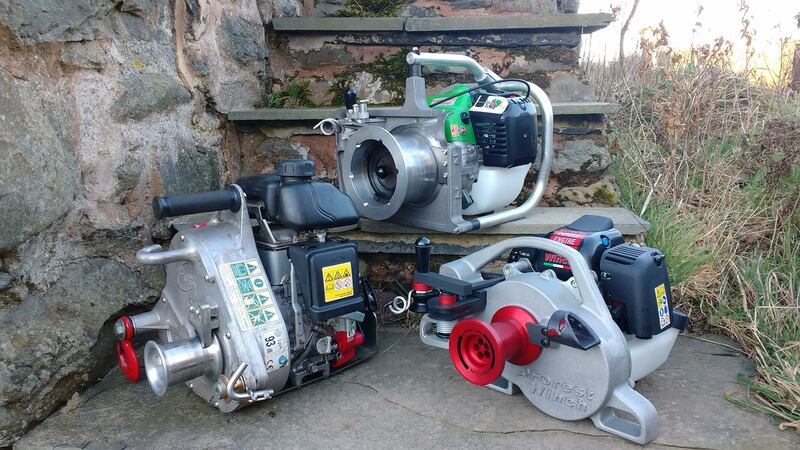 Treadlight Forestry is a specialist dealer of portable capstan winches based in the UK. I started off doing small scale forestry work and I soon realised how important winches were for safely dealing with and moving trees. The trusty ‘Tirfor’ winch was always in the van to get me out of trouble if I got a tree hung up or if I was dealing with windblown trees to secure root plates and winch dangerous trees down. But this type of hand winch has limitations. They are tiring after prolonged use. They are heavy with a metal body and thick steel cable and they are painfully slow. So I started looking around for alternatives. It didn’t take me long to come across the portable capstan winch and instantly realised their potential. They were light enough to carry, strong enough to deal with large trees and fast enough to make timber extraction possible. This makes them perfect for using in sites where you cannot bring a tractor such as wildlife reserves, wetlands, steep sided hills or back gardens. The portable capstan winch differs from other types of winch in that the rope is not stored on a large drum attached to the winch. When the winch is operated a section of rope is wrapped a number of times around the capstan. To operate the winch the rope is pulled by hand and as the rope is pulled it bunches together creating friction between itself and the capstan drum. This in turn means the pulling force of the engine is applied to the rope allowing objects to be winched in with ease. Utilising a small 2 stroke or 4 stroke petrol engine to power the capstan drum makes these winches very portable and allows them to be carried easily on to site. 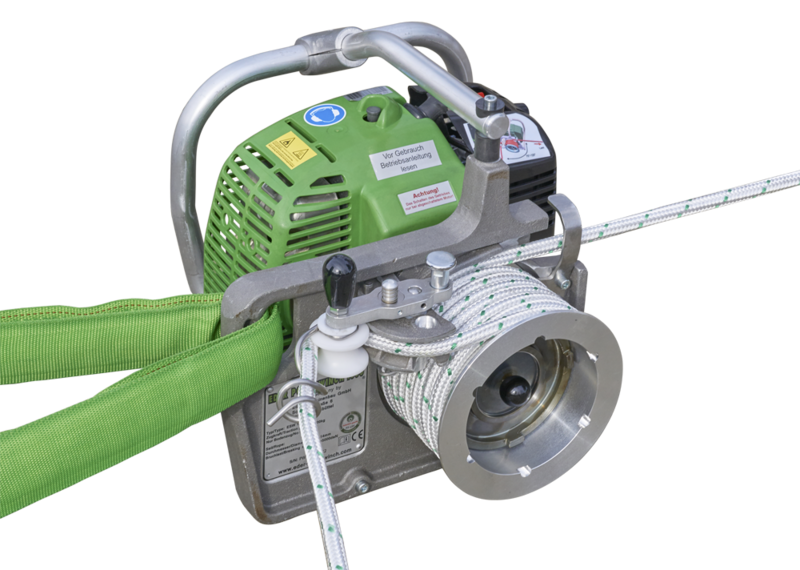 There is now even a lithium battery powered portable capstan winch – the PCW3000-Li – this means no petrol, no fumes and much lower noise. Brilliant! Portable capstan winches are available with a pulling force of between 400kg and 1800kg so they are very powerful machines for their size. 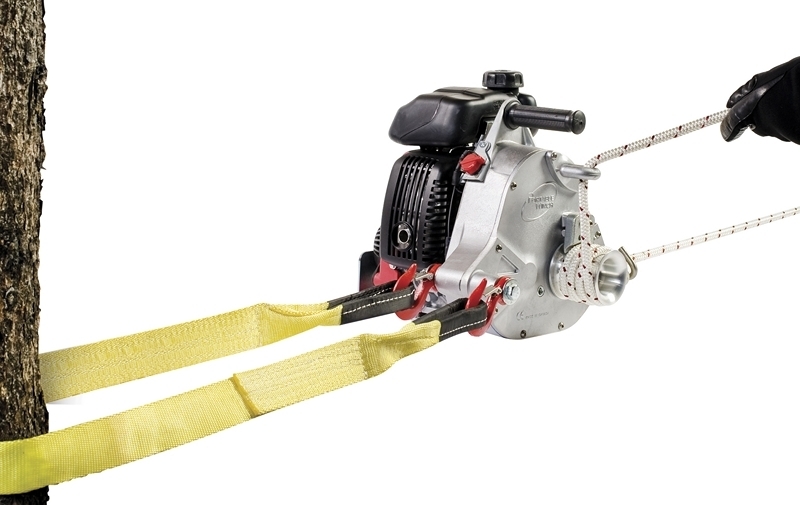 Portable capstan winches are very ‘low impact’ as they can be operated on sensitive, wet or steep sites while doing very little damage and without the need to create tracks or other access routes. Capstan winches use rope rather than steel cable. Rope is safer, lightweight and easier to work with than steel cable. The rope used on a capstan winch can be of any length so if you need to move something 200m you can use a 200m rope. As the rope is not stored on a drum capstan winches are much lighter and easier to carry than drum winches. Portable capstan winches are significantly faster than other types of winch with a ground speed of 12-42 m / min depending on the model chosen. This means that they can extract large quantities of timber and can be used in commercial environments where productivity is a major factor. So what are the drawbacks? Well you need to look after your rope. It is more susceptible to damage than a steel cable and you must make sure it does not come into contacts with abrasive or sharp surfaces. A portable forestry winch is an investment but like any good machines it will earn you money over time by making your work more efficient and productive. As well as the winch there are number of really useful accessories such as high strength rope, choker chains for securing the rope to the tree, pulley blocks for redirecting or doubling the force of the winch, transport case and rope bags for protecting your machine and skidding cones which go on the end of a log to stop it snagging as it is pulled along the ground. Having used a portable capstan winch commercially for a few years I started selling them and from this grew my company: Treadlight Forestry. I can honestly say that other than a chainsaw the portable capstan winch is the best tool I own and don’t know how I worked without one! We sell a range of different makes and models of portable forestry winch each with different capabilities and characteristic. If you have any question or want to learn more then please contact me and I will be happy to discuss the various makes and models.